When people discuss care options for seniors (whether for themselves or their loved ones), they do extensive research online before stepping foot into a residential facility for a tour. Our client in the assisted living space knows this because they saw a significant amount of search traffic hit their site, presumably from seniors and their caregivers. 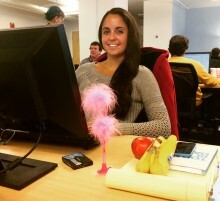 The first piece of the puzzle, getting people to their website, was working efficiently. The challenge for Brafton’s creative teams was to create an online environment that would foster engagement. Traffic was good, but visitors weren’t sticking around on the site. Not enough in-house resource to keep up with content creation. Include strong call-to-actions within articles and through buttons that give users a variety of options to request more information. Mastering your brand’s style and tone is a necessary first-step in content marketing, because when done successfully, it’s how you distinguish yourself online. Brafton’s Senior Writer Alice Pinero says commanding the right tone has played a large role in not only getting viewers to return to the site to read future articles but also to want to read through the whole story. It’s important to think about the different audiences on your website when creating content – and in this case we’re not limiting audience demographics to “the senior” and “the caregiver”. Not everyone who comes to your page is ready to move into an assisted living tomorrow. Your various demographics are all in different stages of the sales cycle – you need content that will cater to all of these segments. Strategist Wilfred Hirst shares how to create content for different audiences in our recent Content & Coffee. Watch here. 76 percent of brands have a corporate blog, and as content marketing efforts mature, readers have come to expect a level of sophistication that isn’t limited to quality writing. People are 10 times more likely to notice visuals than text, and a blog post that is a simple block of text doesn’t cut it anymore. Including more images, like quotes and embedded Tweets, can significantly boost the amount of time a person spends on a page. While these calls to action are static on the page and implemented by the UX team, Writer Alice also includes a branded “strap line” at the bottom of the articles. Straplines link to more promotional, lower-funnel pieces. 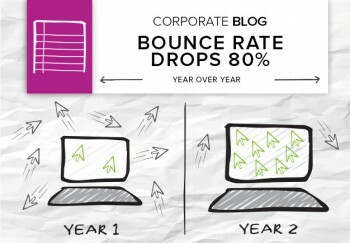 The average blog sees a bounce rate of about 40 percent. When this company’s corporate blog lowered its bounce rate to 11 percent, it was a clear testament that the most successful blog approach combines three elements: strong UX, audience-focused topics and a clear path for readers.